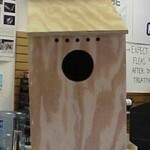 SCREECH OWL BOX: Our Screech Owl Box is built to house the popular owl which loves to feed on rodents. 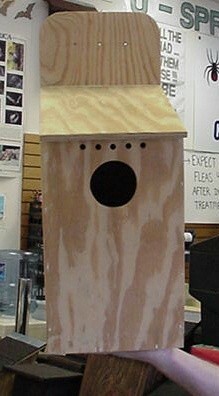 Common yet in need of good housing, this owl provides natural control of many nuisance rodents in urban and metropolitan areas. Our house is made of plywood and measures 23 inches tall, 10 inches wide and 11 inches deep. The entrance hole is 3 inches wide. These houses are not finished and do need a coat of paint or stain and finish. WHERE TO USE IT: Outside mounted to a tree or the side of a building.